This post is an initial hack to have React components render server-side in PHP. Create test.php that concatenates JS code consisting of: stubs, react, custom components. 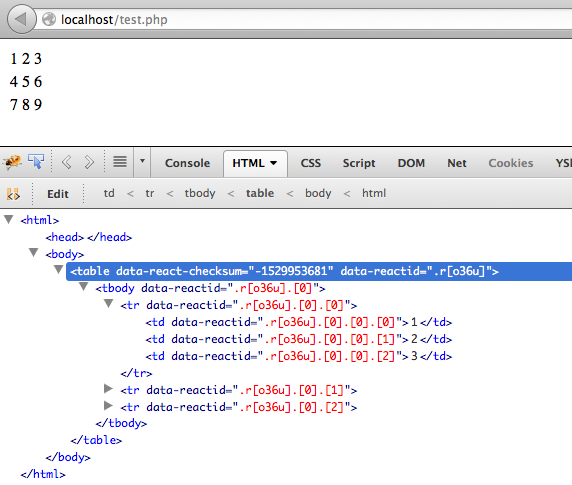 Fetch (or fake) data somehow (this where you PHP code you've been slaving away for the past 3 years shines). Render the custom component with the PHP-fetched data. Hm, easy enough. Now let's start pushing some JS to an array to concatenate later. Concatenating code is ugly, but here in PHP we have to pass JS code to V8 as a string. Surely the following code can be cleaned up a bit by using external files, but for a quick hack it's just "perfect" :). React uses console.warn() and console.error() which do not exist in V8. But there's print() in V8. So warnings will be silenced and errors will be printed on the page. We can be more creating here, e.g. print server-side JS errors in client side JS console but hey, this is a proof of concept. The global jazz is a React bug IMO because at the top of the react.js file there's a bootstrapping code that goes like: window ? window.React : global.React. In V8 there's no window nor global, so hence the workaround.